A few years back, I needed to find a playgroup for my daughter and me. I tried various forums and message boards but had little luck. That’s when someone suggested I check Meetup.com. I am amazed by the number of groups that existed. Family, tech, food, and sports – if you were looking for other like-minded folks in your neighborhood, Meetup.com was where to go. But can Meetups help further my career? Just ask Rich Schwerin and Dennis Shiao. Rich is Senior Content Strategist at Autodesk. Dennis is a freelance marketing consultant. They both have impressive Meetup resumes. Prompted by Kristina Halvorson’s book, Content Strategy for the Web, Rich joined a few content strategy Meetups in San Francisco. He enjoyed them, but commuting to the meetings grew tiresome for this San Carlos resident. So Rich decided to organize his own. Fast forward one year. Rich extended an invitation to Dennis to attend his meetup. Shortly after, Dennis realized he was hooked. Dennis enjoyed connecting with local marketers and wanted the conversations to continue. Inspired by his experience at Rich’s Meetup, Dennis founded the Bay Area Content Marketing Meetup. He started an engaging community from scratch, and today, the group touts over 500 members. This duo knows their stuff. That’s why we invited them to help lead the #CMWorld Twitter chat. The excitement of bringing people together makes putting together a meetup worth it. But organizing one is harder than it looks. So what does it take to organize a successful meetup? We discussed it with our CMWorld community. What follows is a brief overview of the hour. 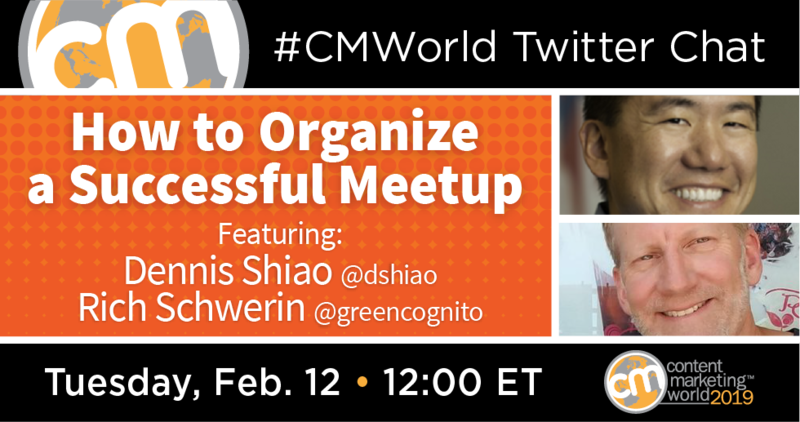 Do you have a topic you’d like to see covered on the #CMWorld Twitter chat? Tweet me and let’s talk! What are some experiences Meetups offer that no other medium can? A5: What if we think of it like a large brainstorming session—but with people outside of our team? How can marketers use Meetups for content marketing purposes? A7: Please, no more Death by Powerpoint. Experts: You know too much. Don’t cram it all into slides. Be selective. Fewer words, fewer slides, more visuals, tell us a story. If you want to take a closer look at Dennis’ Meetup journey, he has documented it in several blog posts. Have you ever been to a Meetup? What did organizers do well? Is there anything you would have done differently? Let us know in the comments below. Enjoy in-person events? Then sign up for Content Marketing World and meet over 4,000 marketers from around the globe. Code SM100 saves you $100 off Super Early Bird rates. But don’t wait – these prices end February 28!